"Pasta, pasta, sempre pasta!" (pasta, pasta, always pasta) me and my dad would sing at the dinner table to the hard frown of my mum. But we didn't mean it, we could eat pasta every day! 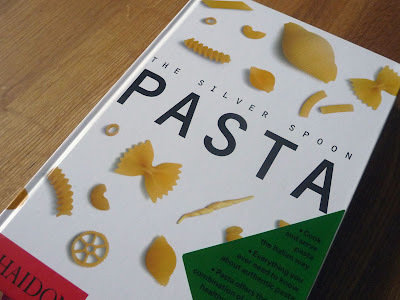 The Silver Spoon: Pasta contains 350 recipes and the mongrel of pasta dishes, spaghetti Bolognese ain't one of them. You think it may be quite difficult to come up with 350 recipes for pasta but when you consider the number of shapes available (hundreds? thousands?) and the variety of sauces, you could easily double that. This book defines pastas and the regions and traditions for each, which is an important part of understanding Italian cuisine. I fell in love with the original Silver Spoon, which was first published in 1950. It is so authentic I would agree with its status as the bible of Italian cooking. My family typically cook many of the dishes that are listed in it on a daily basis and celebrations. Anyone with an interest of going beyond the familiar dishes you find down your local Italain should invest in the book, it really gets under the skin of regional Italian cooking. 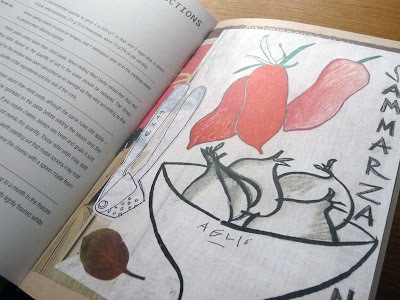 The greatest thing about it is that it importantly catalogues classic regional cooking for future generations. It's massive with 2,000 recipes but never feels overwhelming and is not a pretty coffee table cookbook, it's a workhorse. This Pasta edition is an extension of this book. It has been designed in the same no nonsense manner, with just enough good quality photography and some lovely illustrations, but rests firmly on clarity, good indexing and strong structure. As always, multiple bookmarking ribbons are very handy because you are going to want to cook quite a few things in this book. It has two sections; dried (short and long) and fresh pasta (cut and filled). The sub categories are then the shape of the pasta and the various appropriate sauces for each. 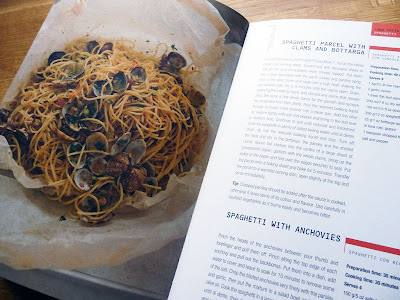 One thing this book does do is shows the versatility of pasta. There are recipes to slum it in front of the telly with a ten minute spaghetti with garlic and chilli or impress your dinner party friends with Tortelli from Lucca which are pasta rounds filled with steak, pork, mortadella and other delicious morsels. 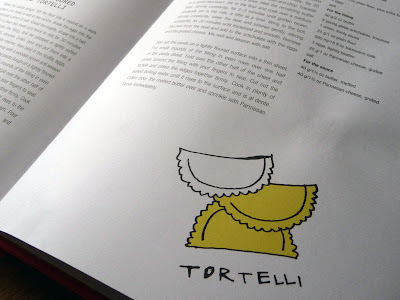 The book is introduced with a bit of history, production and of course a few do it or be hit across the legs by mamma guidelines to adhere to in order to get the best out of your pasta. Also it states which sauces are suitable for which shapes which is essential. Each shape is introduced with a little background history, its regional origins and how it has got its name. Usually pasta shapes are named after their appearance or have a reason for their creation, for example, spaghetti means "small strings", farfalle means "butterfly". Reginette is like a curly edged tagliatelle and was created in honor of Princess Mafalda of Savoy (1125-1158). The name translates as "little queens" as the pasta looks like it has little crowns on the edge. Quite a lot of the recipes appealed to me but a few that really stood out were a Courgette and Almond Ravioli, a simple Spaghetti with Black Olives and Lemon and a very interesting Cocoa Taglierini (very thin tagiatelle) made with cocoa in the dough but served with marscapone, chilli and bay sauce. 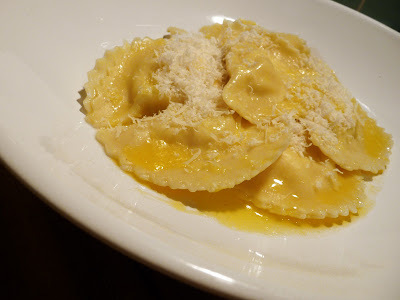 But for review purposes, and when I made them it was Christmas and people seem to put brandy on everything, I chose to make the unusual sounding Brandy Flavoured Potato Tortelli. These originate from the Po Valley in northern Italy. The name derives from torta meaning 'tart'. I normally use 100g of type 00 plain flour and 1 egg per person, but with big fillings the suggested 400g / 4 eggs for 6 people was spot on. 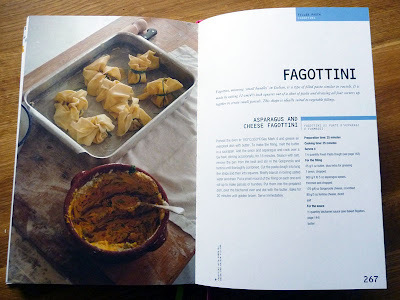 The brandy was not too intense, instead enriching the potato and ricotta filling. I made enough to last two days but the whole batch was polished off in one sitting - so, so good! A simple sauce of melted butter and a little more Parmesan was all that was required. The tortelli can be cut into squares or half moons but I was excited (yes really) about using my new circular pasta cutter that I found in my local Carluccio's for a mere £3.50. Make the pasta dough. Sift the flour into a mound on a work surface and make a well in the centre. Break the eggs into the well and add a pinch of salt. Knead thoroughly, shape into a ball, cover with a clean tea towel and leave to rest for 30 minutes. Meanwhile make the filling. Boil the potatoes in lightly salted boiling water for 25 minutes. Drain, peel and put them into a bowl. Mash, then beat in the ricotta, eggs, Parmesan, nutmeg and brandy with a wooden spoon and season with salt and pepper. Roll out the pasta dough on a lightly floured surface into a thin sheet (I use a pasta machine which is much easier). Put small amounts of filling in even rows over one half of the pasta sheet. Fold over the other half of the sheet and press around the filling with your fingers to seal. Cut out the square tortelli and press the edges together firmly. For the half moons, I cut out my little rounds and placed the filling in the centre, lightly moistening the edges with water and folded over the edges, pressing firmly. Cook the tortelli in plenty of salted boiling water (I always add a little splosh of olive oil when cooking fresh pasta) until it rises to the surface and is al dente. Drain and transfer to a warmed plates. Pour the melted butter over, sprinkle with Parmesan and serve immediately. Prep takes about 1 hour 15 minutes, plus 30 minutes resting and cooking time in total is 40 minutes. 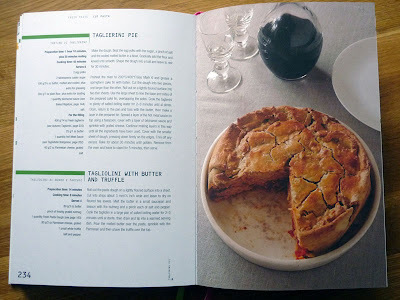 There are many recipes in this book that are around the 20 minutes to plate mark and most are under 30 minutes. The fresh pastas are the ones that take a bit of time and effort but still very doable. As you may tell pasta is close to my heart (and my hips) and I adore The Silver Spoon: Pasta as much as the original Silver Spoon book. This is going to really get me to experiment with pasta and explore the regions further. I received this copy for review purposes but would pay the above price in a heartbeat.